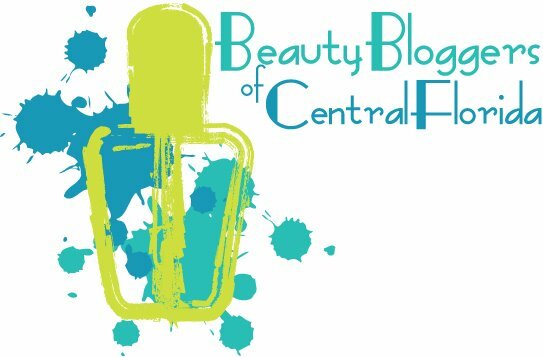 The Beauty Bloggers of Central Florida decided to do a link up of our favorite product this month! But, how do you narrow down all the pretties to just one? Impossible. So, I decided to focus on my favorite scent. Can you smell it? 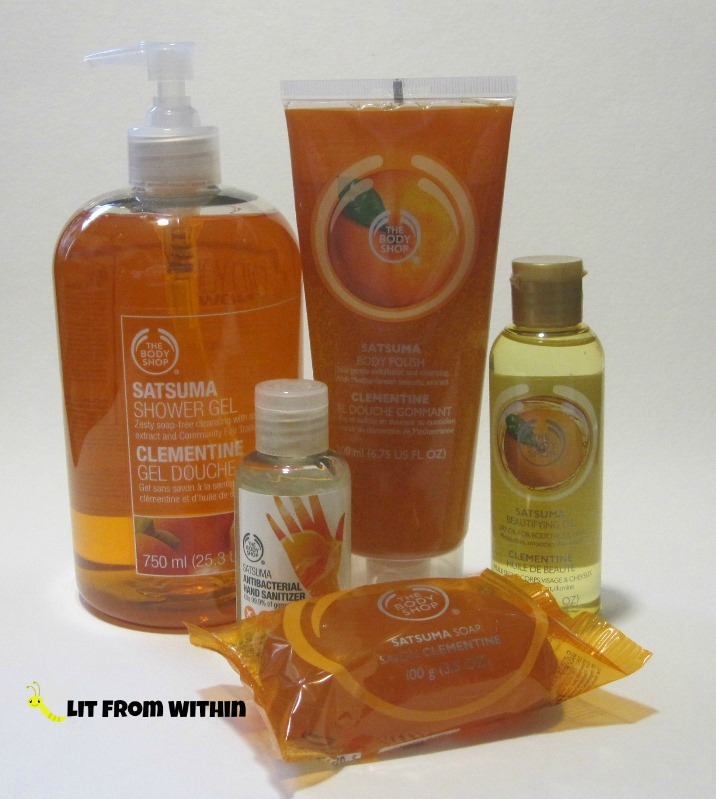 If you've ever had anything from the Satsuma line of The Body Shop, it's unmistakable. I always have at least one product from this line in my shower, and when I need a pick-me-up, it's my go-to. It's a sweet tangerine-type smell, but with a floral orange blossom note. It both refreshes and relaxes me. I love getting a massage with the Beautifying Oil (also good as a facial or body moisturizing oil). The Satsuma Body Polish has gentle exfoliating beads (I believe they are jojoba beads) that aren't too rough, but gently polish the skin, leaving it soft and smooth. And whenever I want to feel clean inside or outside of the shower, I reach for the soap, shower gel, or hand sanitizer. The shower gel also goes in some of my liquid soap pumps that I keep in the kitchen and bathrooms. I love that I can take this scent anywhere I want, for a burst of sweetness wherever I go. 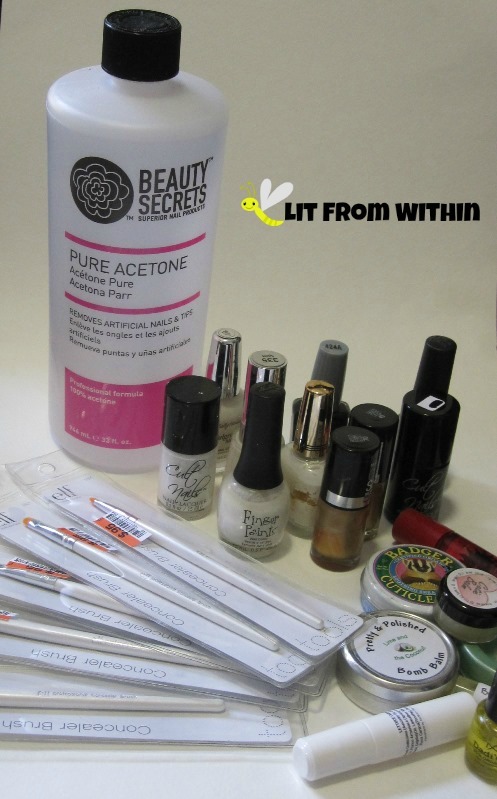 Do you hoard products in a particular scent? Or do you like a particular product in many scents? 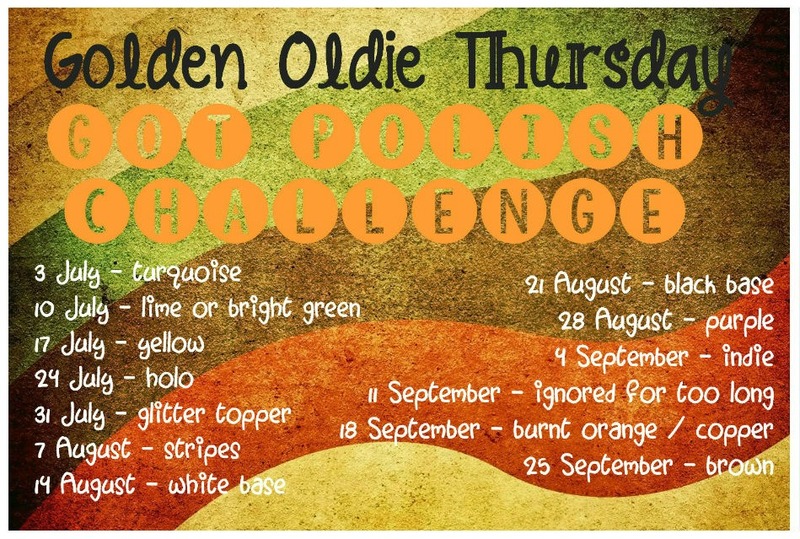 Well, to everything there is a season, and the season of the Tri-Polish and Golden Oldie Crumpet Challenges has come to an end. Today is the last Tri-Polish challenge, and it is also the beginning of the new Crumpet challenge, the 52 Week Pick 'n Mix challenge! To celebrate, I have two manis, and two linkups. 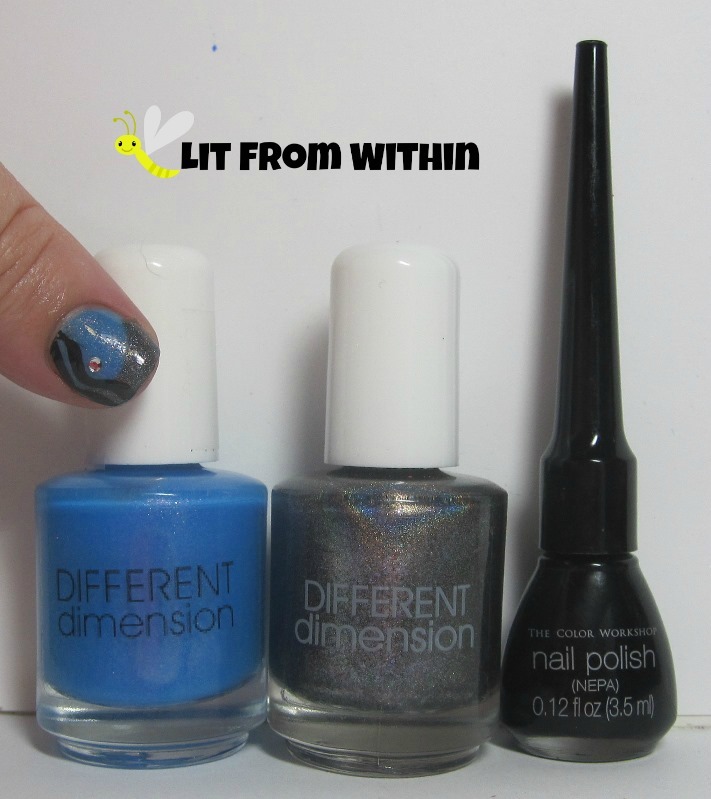 For the Tri-Polish challenge, it seems only fitting that I only get in two of the colors - grey, and teal. I've always been an underachiever. The polishes are so pretty, though, maybe you won't mind. 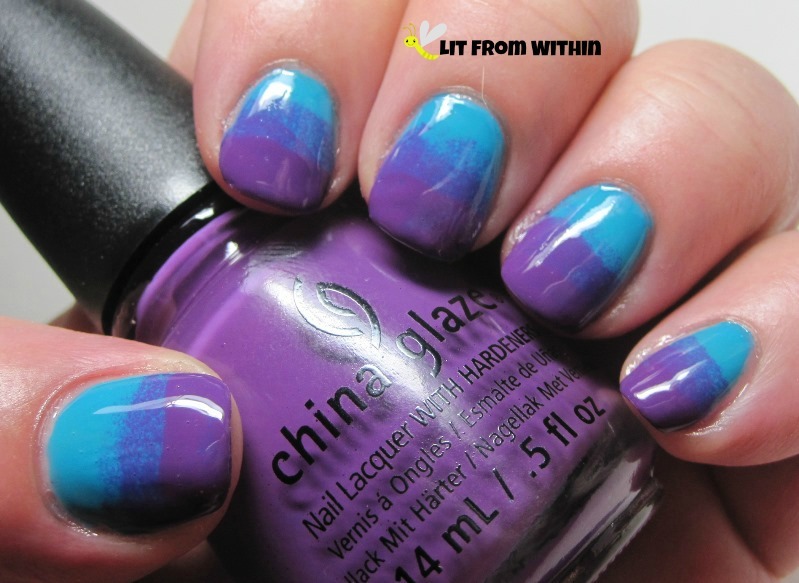 I started with Different Dimension Have A Grape Day, which is a thermal polish... but I couldn't capture it. This design is inspired by Bianca Fredrich. Her acrylic creations are so elegant. I improvised on my nubbins. 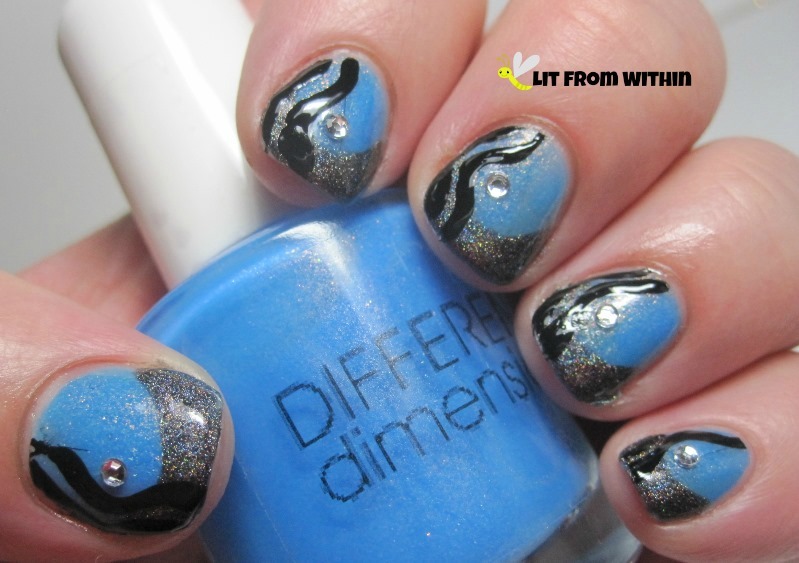 The French Tips are done with Different Dimension Gasoline Rainbows, a gorgeous charcoal grey holo with a rainbow holo, and then I used a black striper and added a little rhinestone. Bottle shot: Different Dimension Have a Grape Day and Gasoline Rainbows, and a black striper. The first prompt for the the Pick 'n Mix challenge was to do a 2-color gradient, and include a teal. 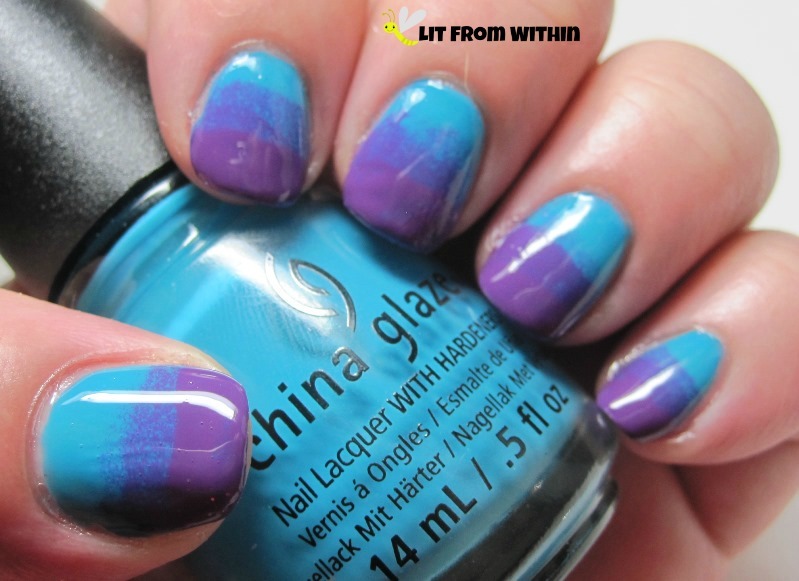 I started with 2 coats of China Glaze Wait 'n Sea, and then did the gradient with China Glaze X-Ta-Sea on the tips. Kinda looks like I used three colors, doesn't it? That's just the sheerness of the purple, letting the teal bleed through. 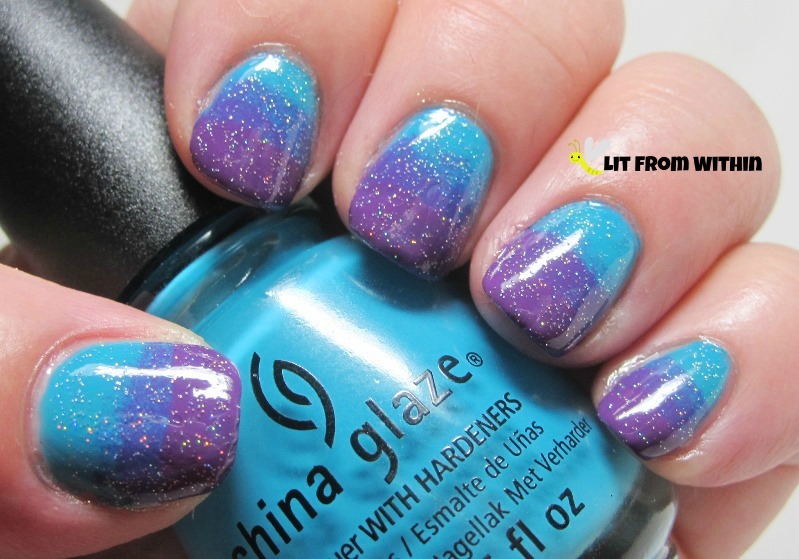 There has been a resurgence of the popularity of China Glaze Fairy Dust in some of the polish communities, so I couldn't resist Fairy Dusting All The Things! It was so sparkly in person, I couldn't even capture how gorgeous. 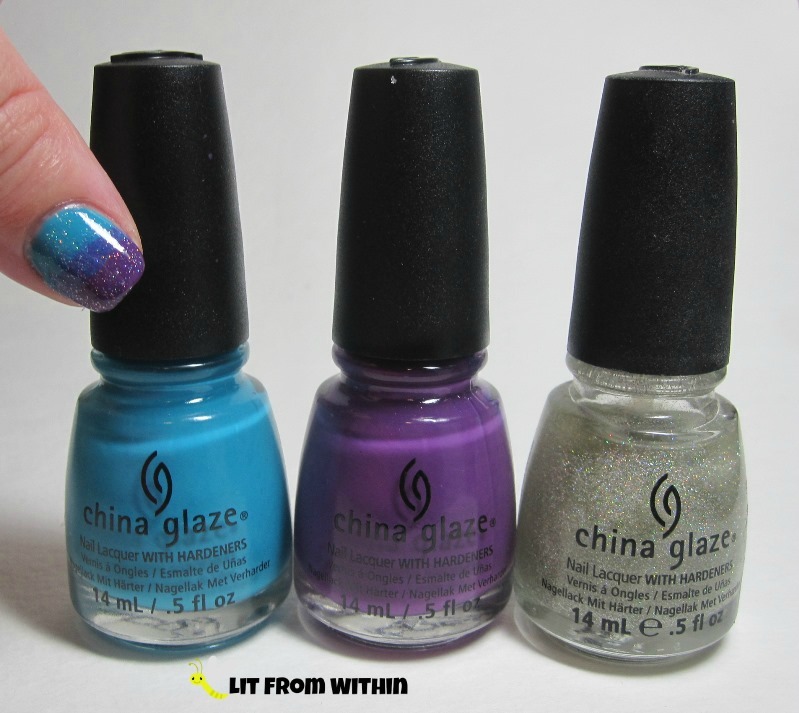 Bottle shot: China Glaze Wait 'n Sea, X-Ta-Sea, and Fairy Dust. I hope this was a good send off for the previous Crumpet challenges, and a good intro to the new one! 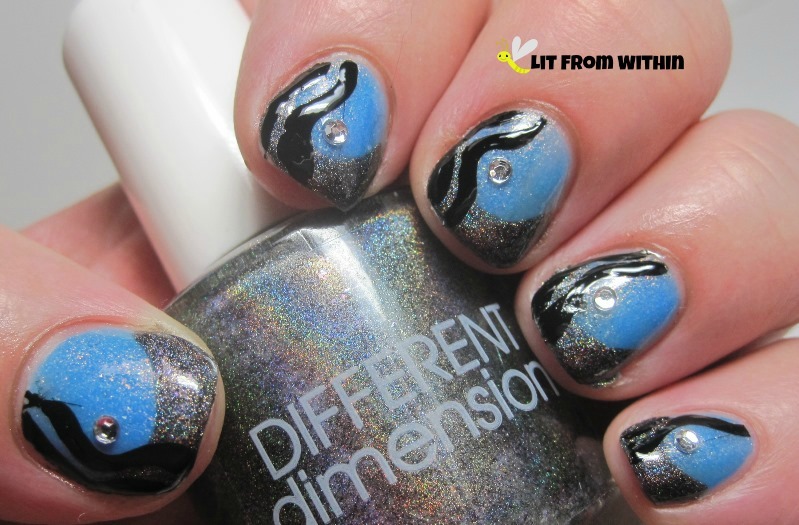 I hope you'll continue to join me in finding new colors, combinations, and patterns in exploring nail art! As always, I encourage you to share your creations on my Facebook page! Have you heard of Tea Tree Oil? I first heard of it as an ingredient in my dogs' Hot Spot spray, a topical treatment for sores on their skin. I also started buying an ear cleanser for my pups that included Tea Tree Oil, and then, I wouldn't buy either of these types of products UNLESS it had Tea Tree Oil. Why? It worked. Their sores would heal up because the oil kills bacteria AND the dogs didn't want to lick it off! Their ears smelled better. Then I heard it was good for a plethora of human issues, too, and that got me a little excited! Turns out, Tea Tree is one of the most versatile essential oils! It fights all kinds of nasties like lice, yeast infections, cold sores, dandruff, warts, psoriasis, eczema, and my fave - acne! Apothecary Extracts was founded in 2013 because they wanted a brand of oils that was transparent about what was in them, and where it came from. Their Tea Tree oil is as protected as much as possible from pesticides, and tested by gas chromatography for purity. Their oil is free from preservatives, artificial color, fragrance, chemical solvents, petroleum, mineral oil, and parabens. Check out the monster bottle you get when you order (exclusively from Amazon.com) - 4 fluid ounces! 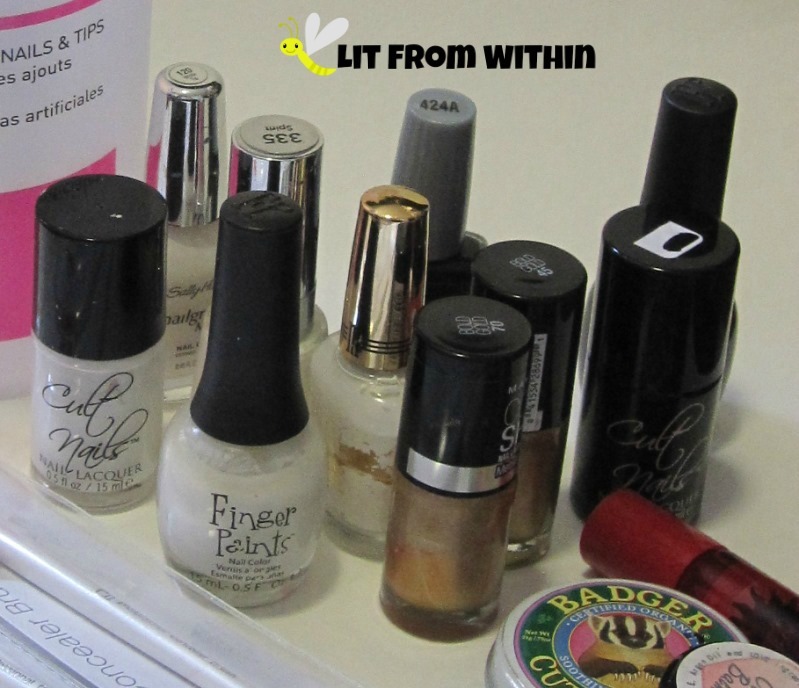 Most bottles of oil are either 2 oz or less (nail polish bottle is just for comparison - not included!) You're going to want a huge bottle, though, because they also send you an e-book full of recipes. 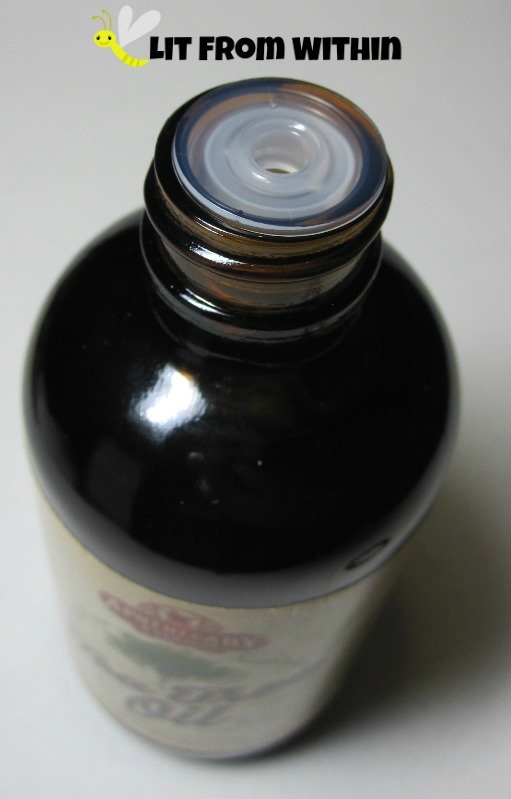 The bottle has one of those slow dropper applicators. It's handy if you want to put some on a cotton ball, but I found it frustrating to use to count drops for recipes, and I had to take it out all together for measuring anything more than a few drops. The e-book has lots and lots of recipes - everything from skincare to household cleaners. I made a few of them over a weekend. First tip: unless you really, really, really love Tea Tree Oil, don't try to make all the recipes in one weekend. I was getting a little sick of the smell. It's strong and medicinal. 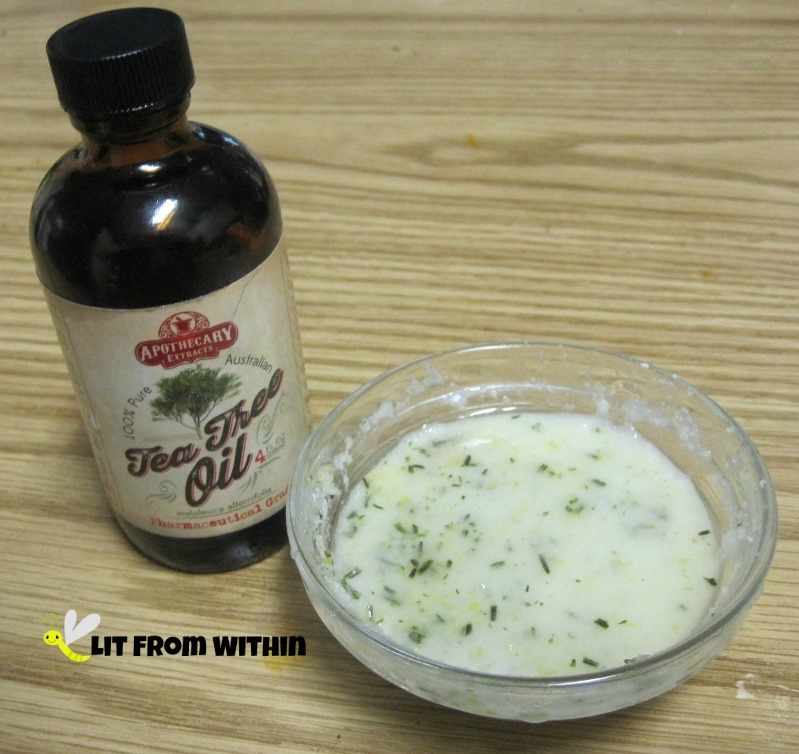 My first recipe was a hair treatment made with the Tea Tree Oil and Coconut Oil. 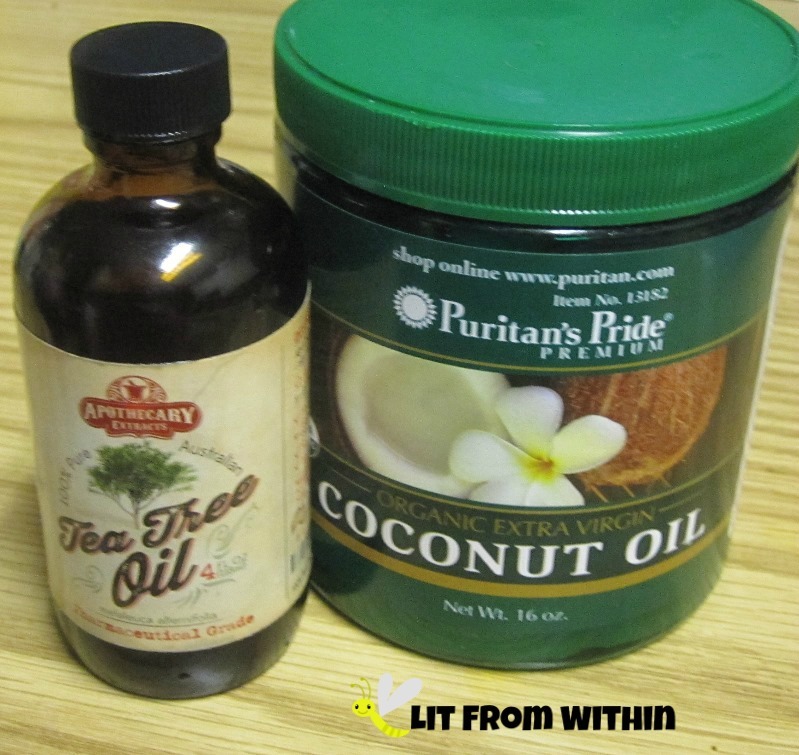 After melting about a Tablespoon of Coconut oil, you simply mix in a few drops of the Tea Tree Oil and then apply it to your scalp. You then can leave it on for 20 minutes, or all night, and then shampoo your hair normally in the morning. Here's the problem. My hair was already dirty, which meant that my scalp was a little itchy. Then, I put more oil on it. Then, I scratched my head. Usually, absentmindedly. Then, I would touch my eyes. Bad move. The oil, it burns. So, if you're going to do this, try not to scratch your head. Or, don't touch your eyes, or both. Seems pretty simple, doesn't it? The next morning, I made a batch of their Tea Tree Oil shampoo, with castile soap, a few drops of jojoba, the Tea Tree Oil, and water. It lathered nicely, and made my hair nice and clean. It was actually a good cleanser so that I could do a nice deep conditioning masque and not worry about buildup. I also made an eczema scrub for my husband to use in the shower. This was only a little more complicated, and required using a little food chopper to dice up the fresh rosemary and mix it with the salt and lemon rind. Tea Tree Oil and lemon juice were added afterwards. I only made enough for one application. It did seem to dry out my husband's eczema patch on his shoulder. The last treatment I did was a doozy. It was for a face masque made with clay, Tea Tree Oil, and water. I can't recommend it. The original recipe called for 4 Tablespoons of Tea Tree Oil to 2 Tablespoons of clay (I used Bentonite, which I'd used before) and then enough water to loosen the paste. I only used one teaspoon of each, and then when I added some water, the whole mixture separated into a clumpy mess that I could never quite get integrated again. I could only leave the masque on for about 10 minutes instead of the recommended 15, because my face started *burning*. When I removed it, it looked like I had a bad sunburn. Luckily, we have an Aloe Vera plant, and it was just the thing for cooling down my face. So, if you're going to use it in a masque, I would recommend starting off with a blend in a carrier oil, or adding a few drops to a store-bought masque or even to a DIY masque. There's no denying that Tea Tree Oil is great for acne, but if you're not used to it, it's a little strong. I am definitely looking forward to trying this oil for cleaning, and I understand it's great for removing skin tags. I'm going to look for some recipes to make my own doggie products, too, because I know it's great for their skin issues. 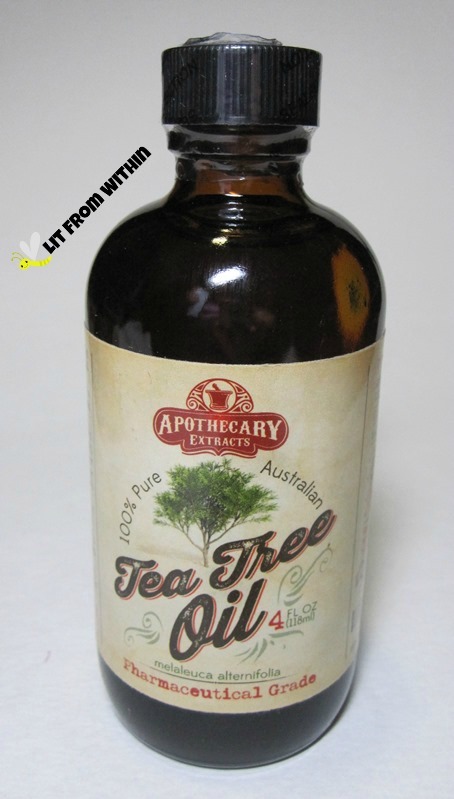 And now I know that I can get pure, tested Tea Tree Oil from Apothecary Extracts, so why get anything else? As of this writing, this offer is only available through Amazon.com for $24.99. 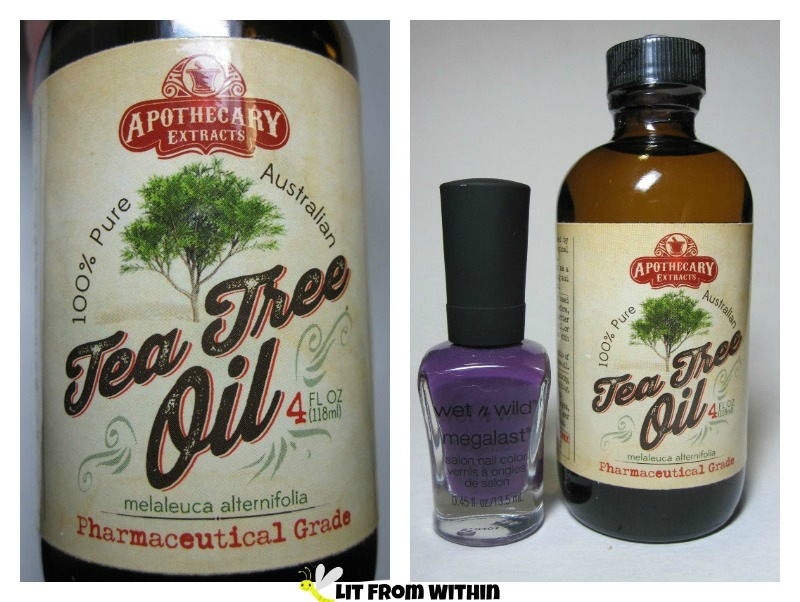 Have you ever used Tea Tree Oil? Did you have any idea how versatile it is? 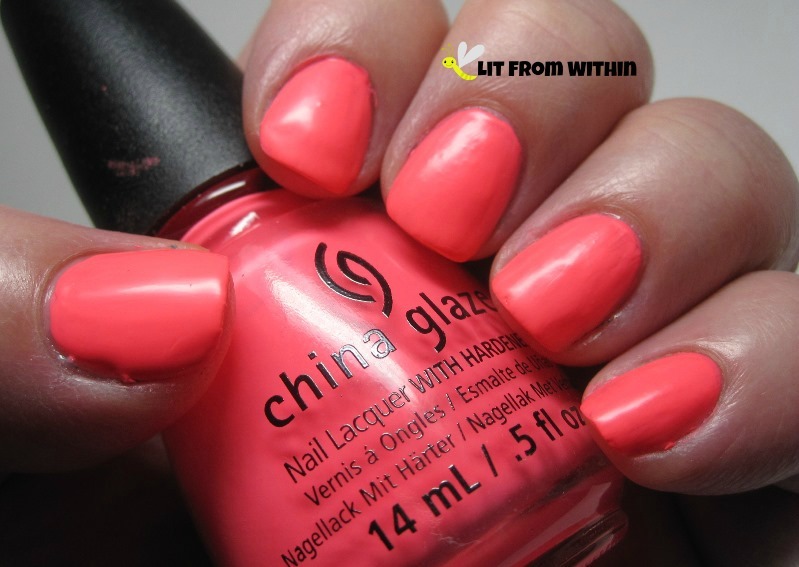 I didn't know that China Glaze Thistle Do Nicely was a neon when I got it out. I like neons okay. They dry quickly, so you have to work quickly. And, they make me look like I got a tan. Today's challenge is to do a 'Funky French' so I rifled through my tips plates. I *rarely* use these. I don't have enough 'tip' for these to make much sense, usually. 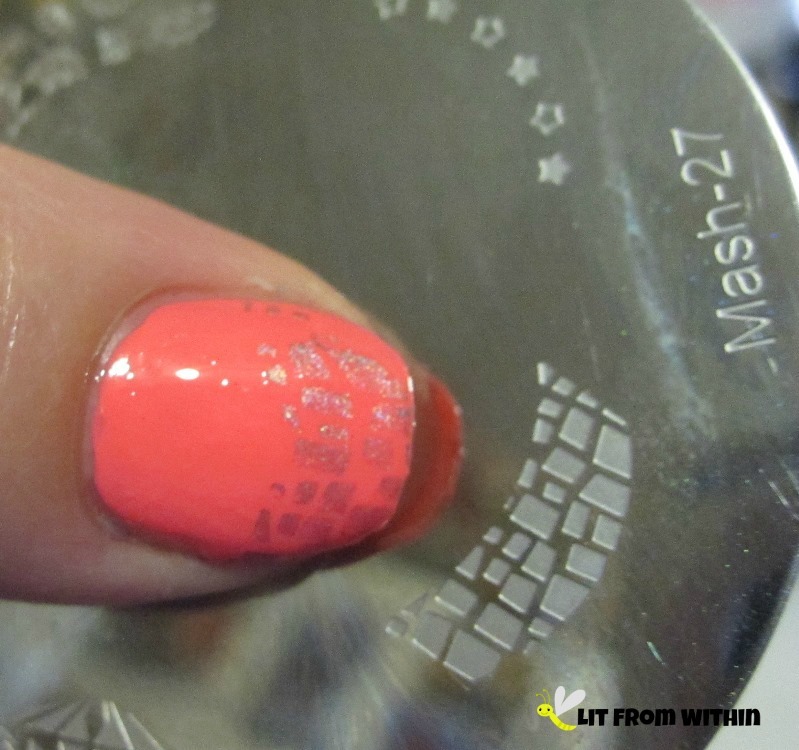 But I thought this tip from Mash 27 would look good even if it wasn't a whole stamp. 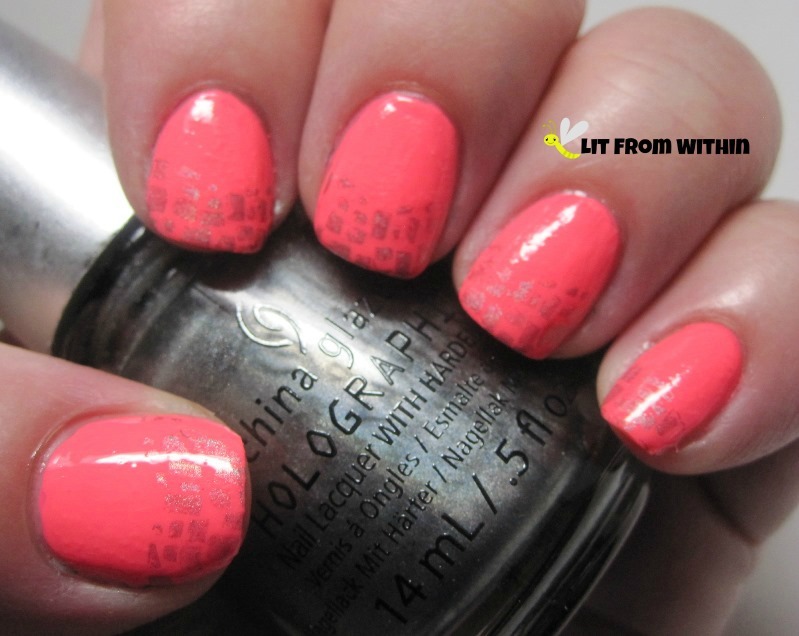 I used China Glaze Cosmic Dust for the stamping. In my mind, this was going to look like shattered pieces of glass, twinkling on the pink background. 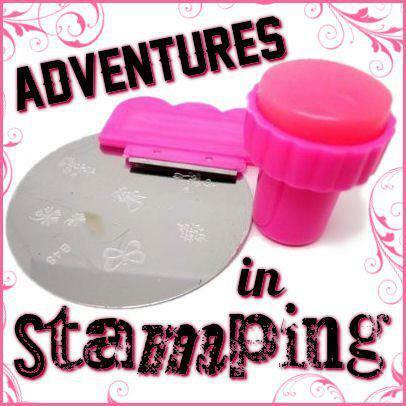 Instead, it's a lot of squinting to see if the stamp transferred. So, I got out my Wet 'n Wild Black Creme and stamped it again, and then did a little more Cosmic Dust over that. Gone is the shattered glass effect; now there's an 80's vibe. 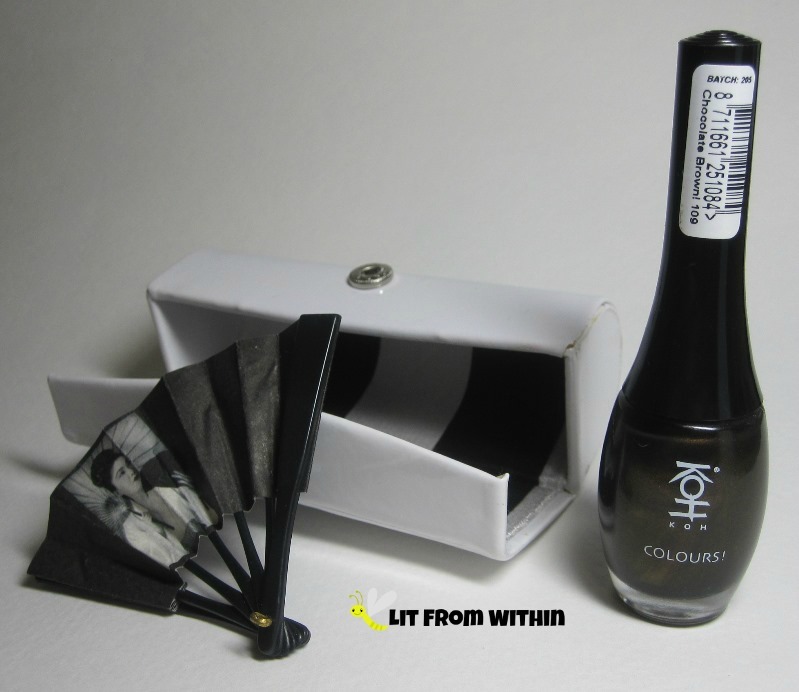 Bottle shot: China Glaze Thistle Do Nicely, China Glaze Cosmic Dust, and Wet 'n Wild Black Creme. A lot of my nail art is made up of 'oops' and then, 'I totally meant to do that!'. No one can tell you that your art isn't right. Own it. And then, if you're still not happy, slap some glitter on it! Whew, what a busy week. Things just start getting a little crazy in the Fall, don't they? It's been raining this week to the point of flooding, and while I'd like a little more sunshine, I'm okay with the temperature backing down a little. Not that it's cool yet here in Florida, but it's got me in the mood for Fall colors - berry, wine, and ... brown. 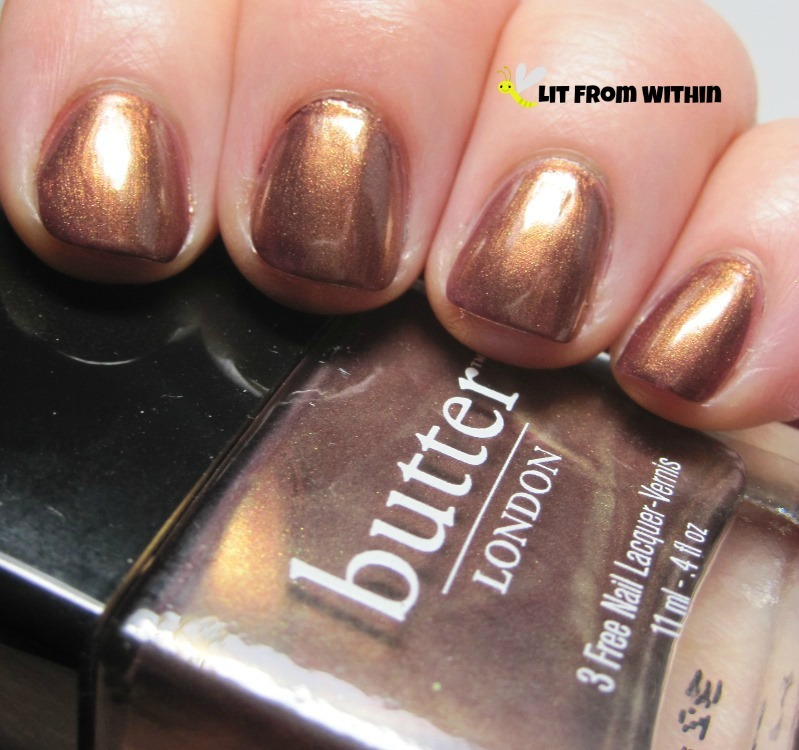 One of my fave browns right now is this metallic coppery-brown from Butter London - Trifle. 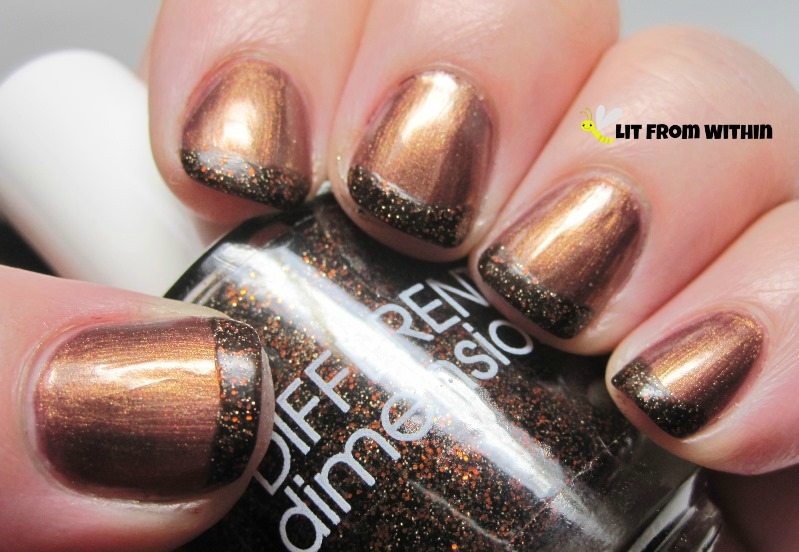 I added a funky French tip with Different Dimension It Rubs The Lotion On Its Skin, a brown and red glitter from last year's Halloween collection. Have you seen her new one for this year? I need Ghostbusters. 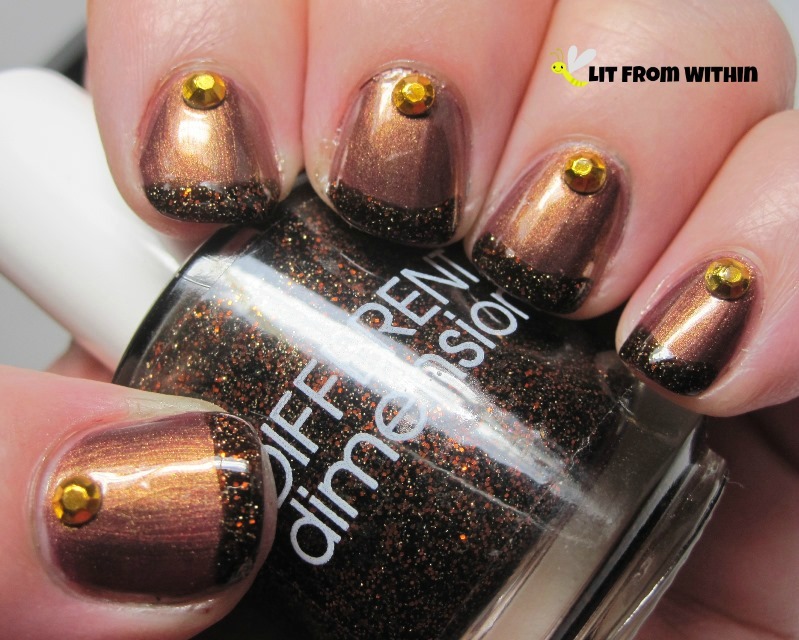 And, because you know I like sticking things on my nails, a golden metal stud. I love that golden marbling in the Trifle bottle. But, really, who can think of Trifle without thinking of the famous Friends episode? "What's not to like? Custard - good! Jam - good! Meat - goooood!" 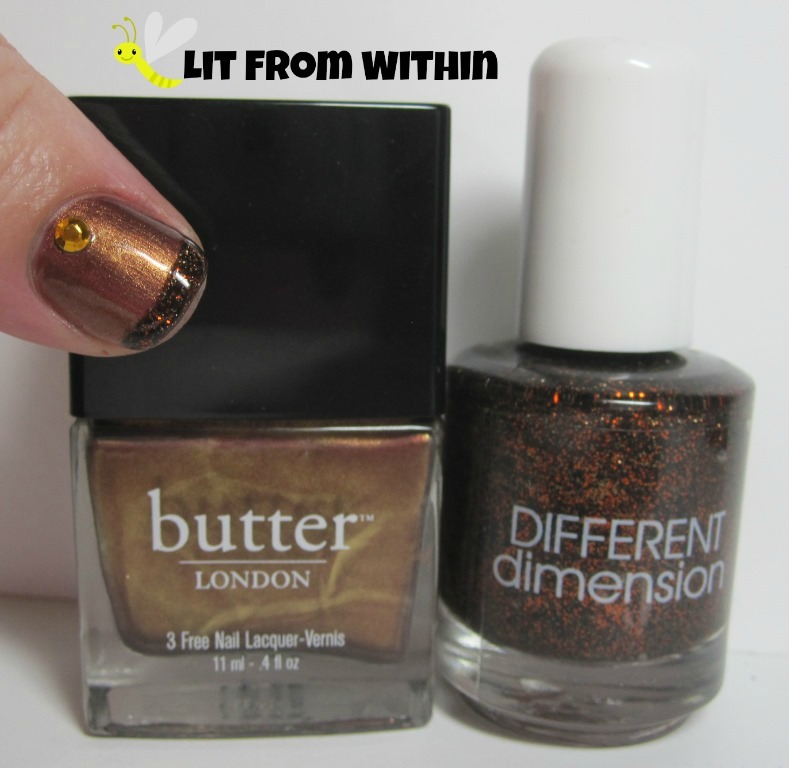 Bottle shot: Butter London Trifle, and Different Dimension It Rubs The Lotion On Its Skin. Some of the beauty bloggers from The Beauty Blog Coalition and Beauty Blogazons came together to write about some of the beauty products we can't be without. I am a bit of a hoarder by nature, so it wasn't a surprise to take a quick look around my desk and see some things that I have definitely collected - and buy multiples of when I find them. This picture doesn't even do my collection justice. I just picked a few of each - and only nail stuff for this post. There are lots of makeup things I hoard, too. Do you think they have an AA-type thing for this addiction? Because of my love of nail art and stamping, I collect black and white polishes and my fave stamping gold polish. 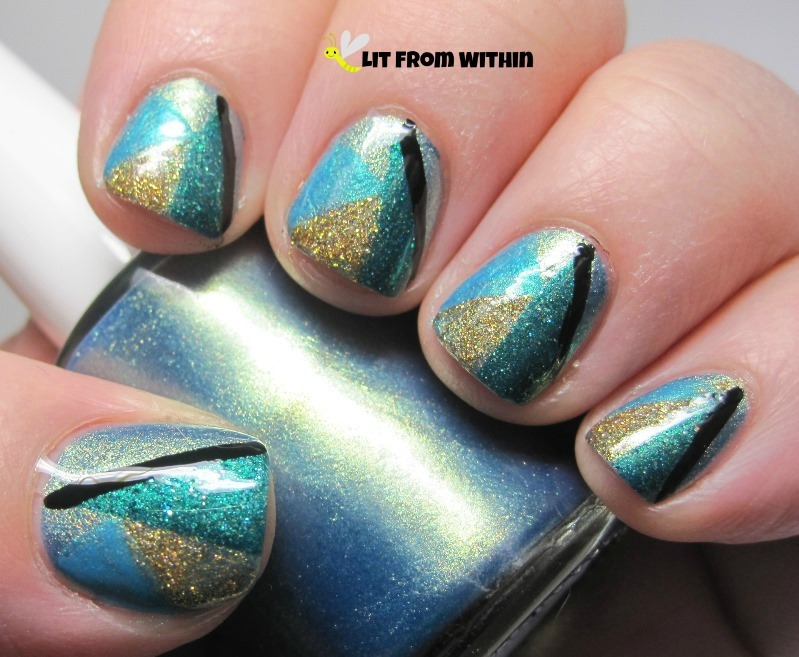 I am always trying to see what polishes work best for nail art. 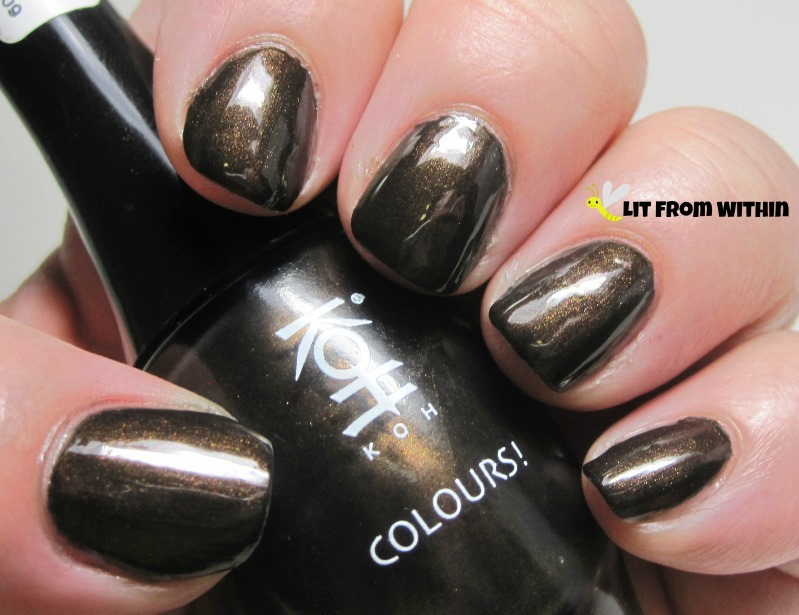 When I find polish on sale, I'll often snap up a few bottles of these! 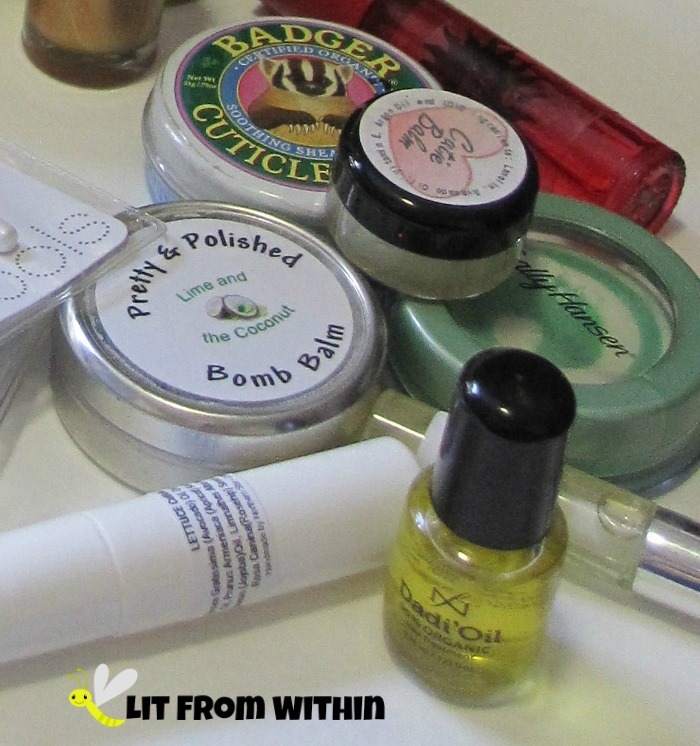 I never knew anything about balms and oils before getting into nail art. Now, I can't get enough. I even make my own oil blend that sits on my desk, too. There's some kind of oil or balm where I sit to watch TV, my bedside, my purse, and even in the bathrooms! I love the ELF concealer brush for cleanup, and have 3 or 4 on my desk in various states of use, and plenty of new ones waiting in the wings. I have tried other brushes, and I just keep coming back to this one! I buy them on sale when I can, but at $1 or less, I'll buy a bunch at a time. 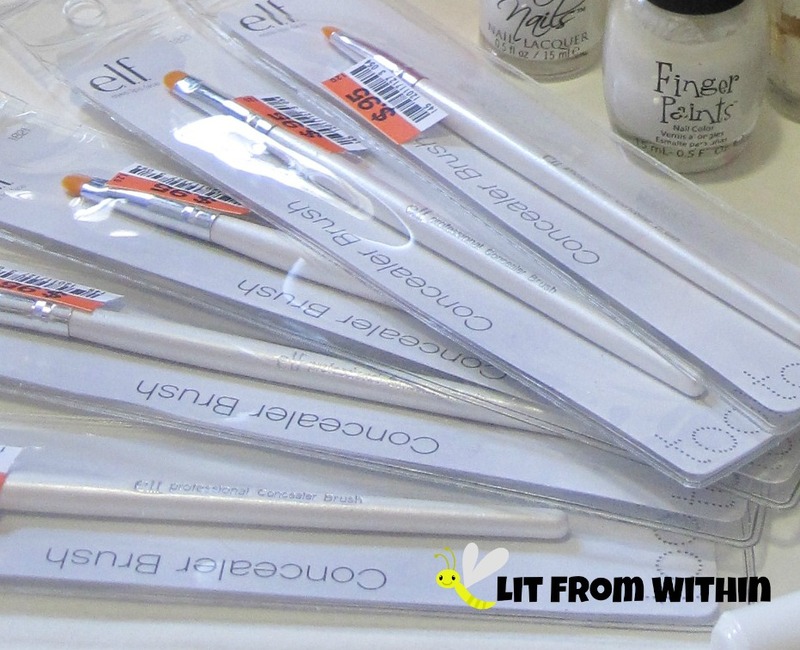 I tell myself that I'll give them to nail friends, but I'm really hard-pressed to part with them! What beauty product do you stock up on? What product gives you the jibblies to think of running out of it? If you've read any of my skincare reviews, you might know that I have oily skin that's prone to breakouts. I'm also over 40, which means that my skin is aging. This is totally NOT FAIR. Just putting that out there. Be that as it may, I have to deal with it in several ways. I'm incorporating more skincare into my routine, paying attention to how I cleanse my skin, and using tools like this Majestic Bombay Blemish Extractor. When you first get it, it comes in a plastic sleeve. I recommend washing it and then sanitizing with alcohol before using it. 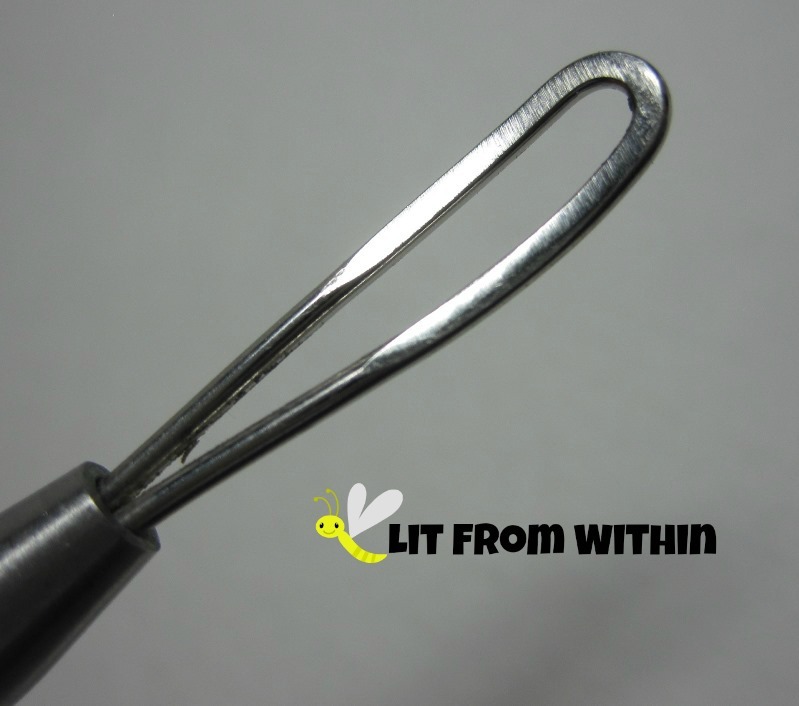 One of the main benefits of using a metal tool like this is that you can santitize it. If you've been using your fingers to pop pimples, you have probably been spreading bacteria around your face and creating more problems. Most people's fingernails have bacteria breeding grounds under them. 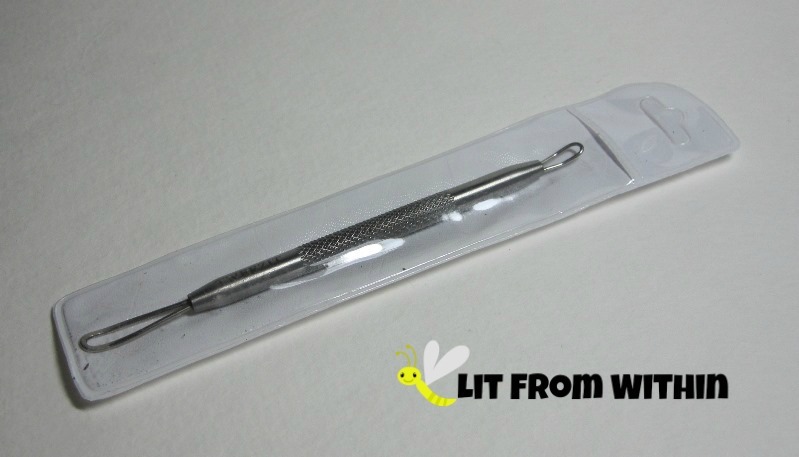 Another reason to use this tool is that the ends are shaped differently for extracting particular types of blemishes, which means that you'll need less pressure, and you're getting a more targeted area. This leads to less bruising and scraping of the skin. My aging skin appreciates not being scraped and bruised as much, too. Why do things take so much longer to heal now than they did in my 20's? 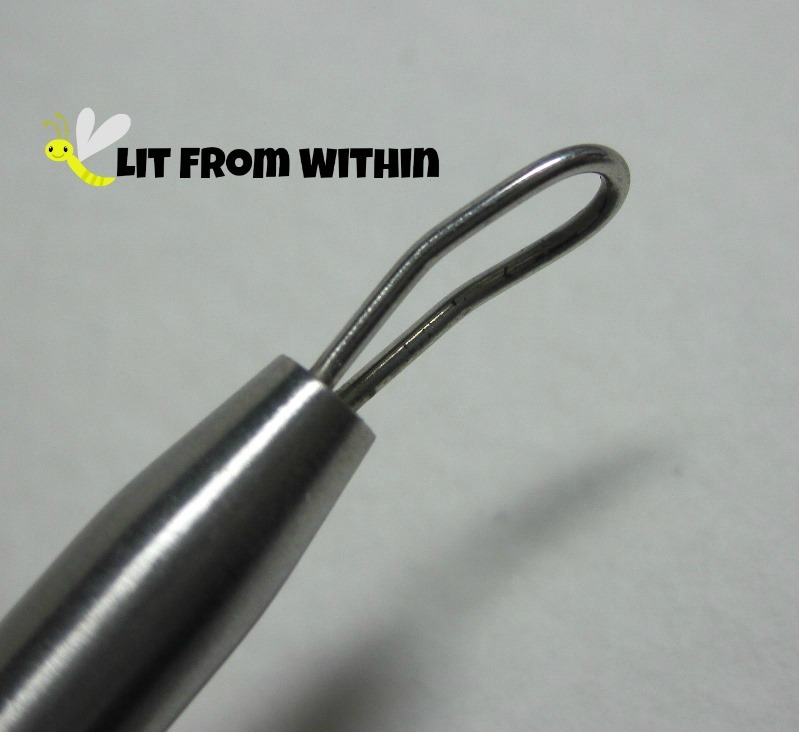 This narrow, angled tip is good for digging in under a blackhead. It also fits better into those crevices around the nose, where I tend to break out. Be careful with how much pressure you exert, though - this end can hurt if you're not careful. This wide, flat side is better for removing whiteheads that have broken through the skin. It spreads the pressure out over the edges of the pimple, helping to get a better extraction. 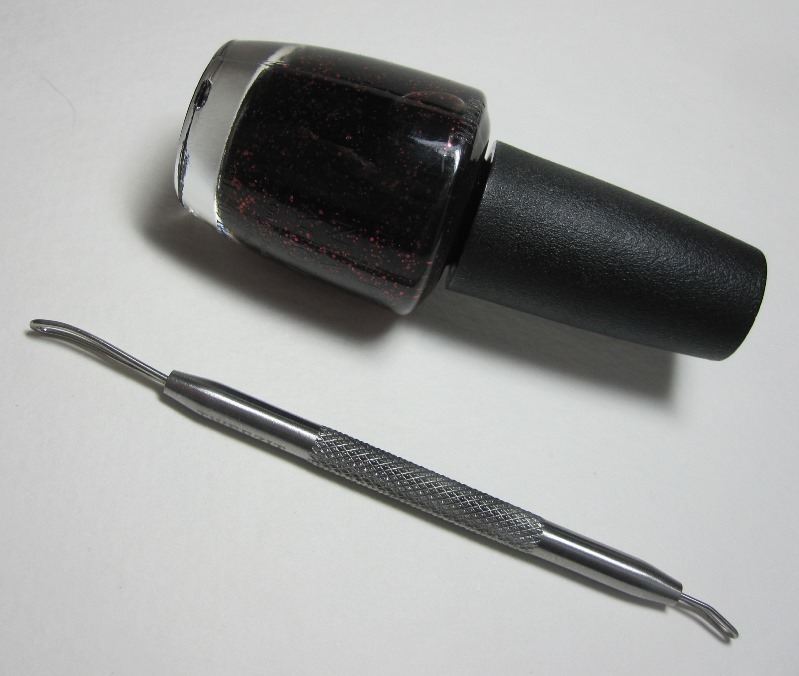 This tool is a little longer than an OPI bottle of nail polish (polish not included! ), and is sturdy and well-made. I have had other extractors that fell apart during cleaning, or even during extracting, but this one has survived almost daily use for about a month. Thank goodness it travels well, too, because I can't imagine going on a trip without it! I spray it after each use with alcohol, and then store it with my makeup brushes, so that it gets washed when they do - roughly once a week. As of this writing, the Majestic Bombay extractor is available on Amazon.com for $7.99, and ships free with Amazon Prime. 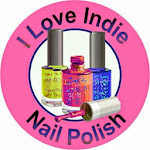 When I started developing this rabid addiction to nail polish, there were some brands I was desperate to try. 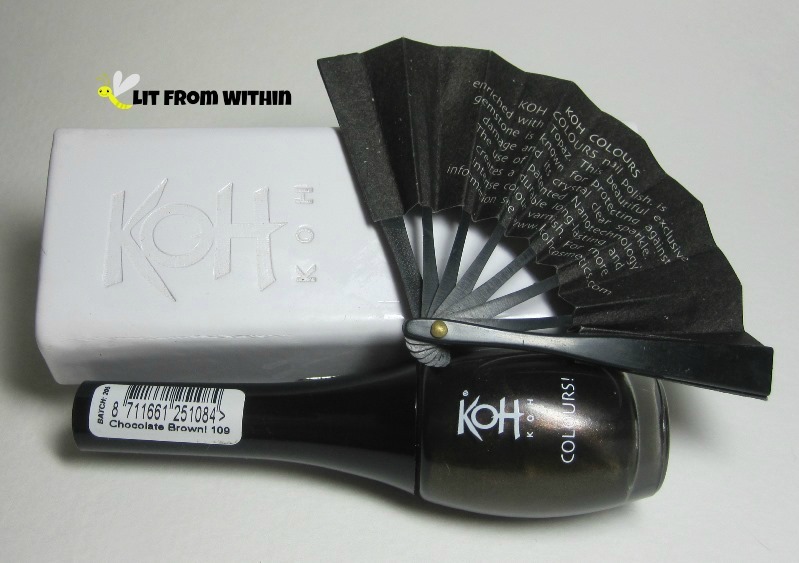 KOH was one of them, even though I had to have it shipped internationally to get it. 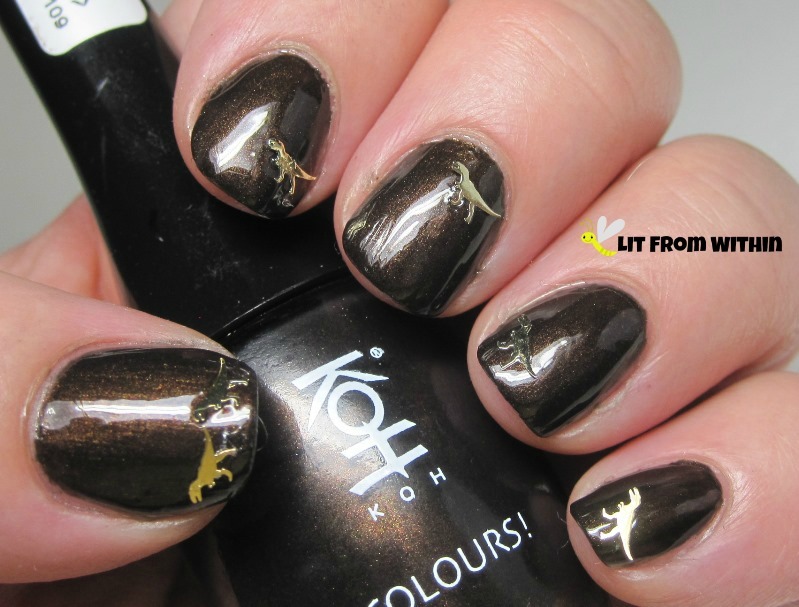 This lovely brown is KOH Chocolate Brown. 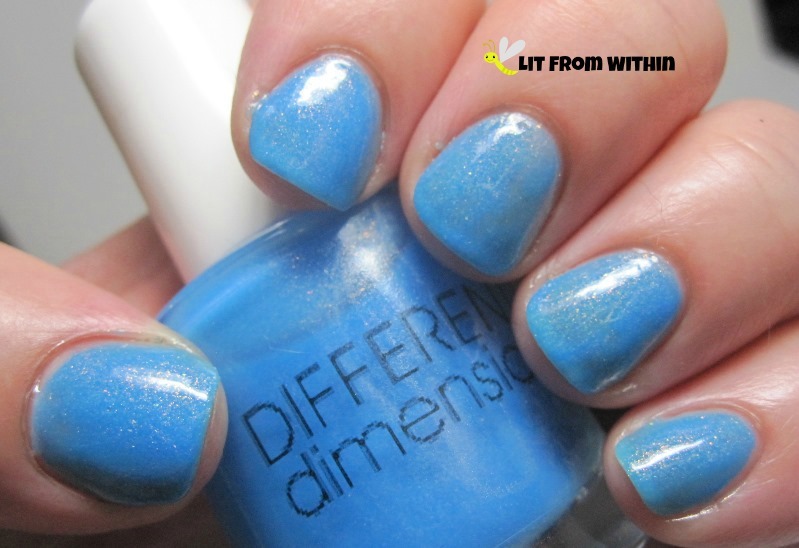 I love the subtle shimmer, which is apparently due to the addition of topaz. It's such a rich polish. I've never seen polish come with a leather (or faux leather, I'm not sure) and lined snap case, with a little fan for drying your nails. LUX. Yep, I can't wait until the end of the post for the bottle shots. The fan is too cute, and the embossed polish case is such a nice touch. I even love the shape of the bottle. 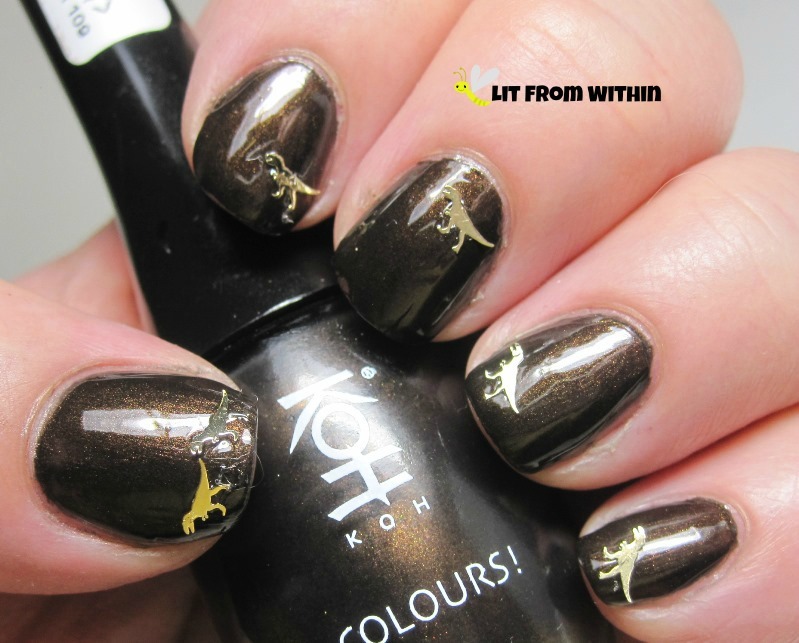 So, when I was thinking about nail art, I immediately thought of T-Rex, the King of the Lizards, for this royal-treatment of a polish. These gold foil t-rexes are small, but sharp! they're made of gold-colored foil. I bought them from The Sparkly Shop. I think they're totes adorbz. 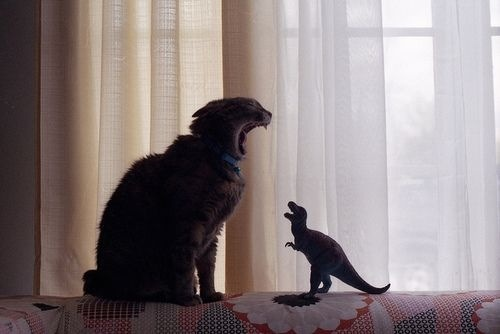 Totes T-rex Adorbz, y'all. What would you pair a T-rex nail charm with? 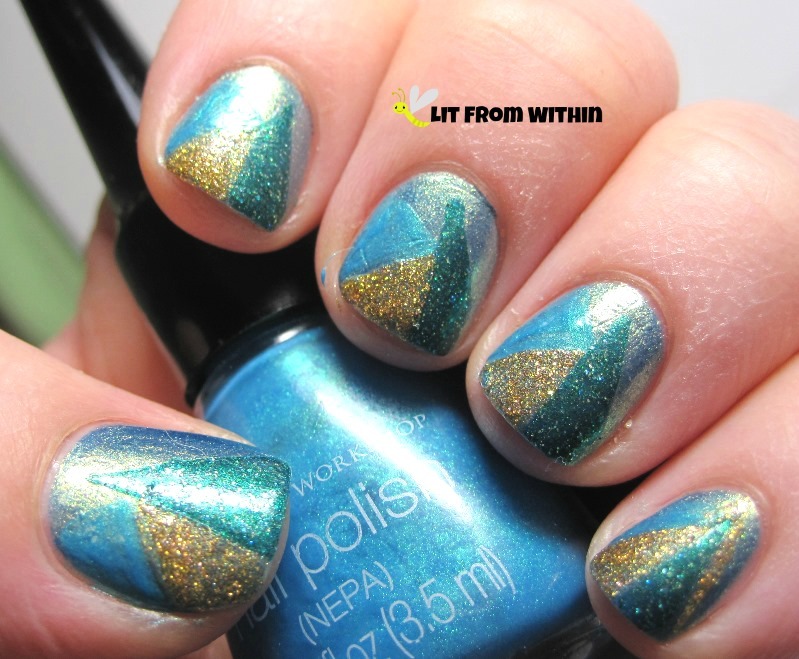 Today is the last day of the Geometric mani theme for this challenge! 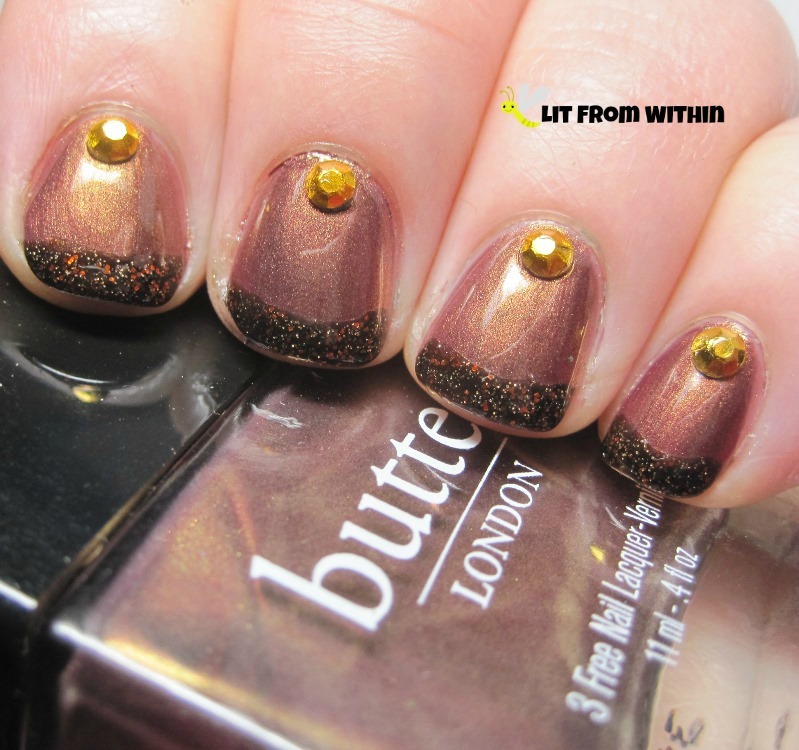 I dug into the vault for this one, for a mani I liked, but just hadn't posted yet. I started with a gorgeous shimmery teal, Carpe Noctem South Haven Sunset. In an unusual move for me, I wore Sunset Haven for a day, and then dressed it up. You can tell by the sheet marks and scratches! 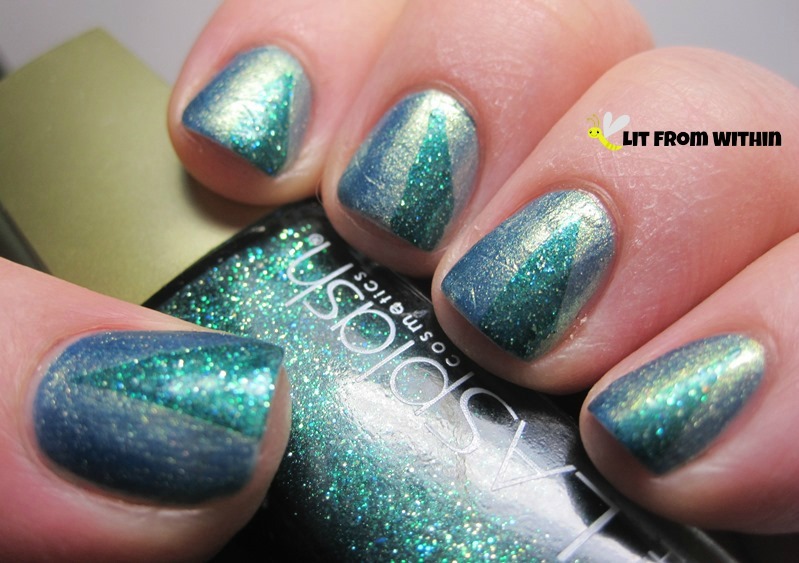 I used tape to create some triangles with LA Splash Ocean's Fairy. 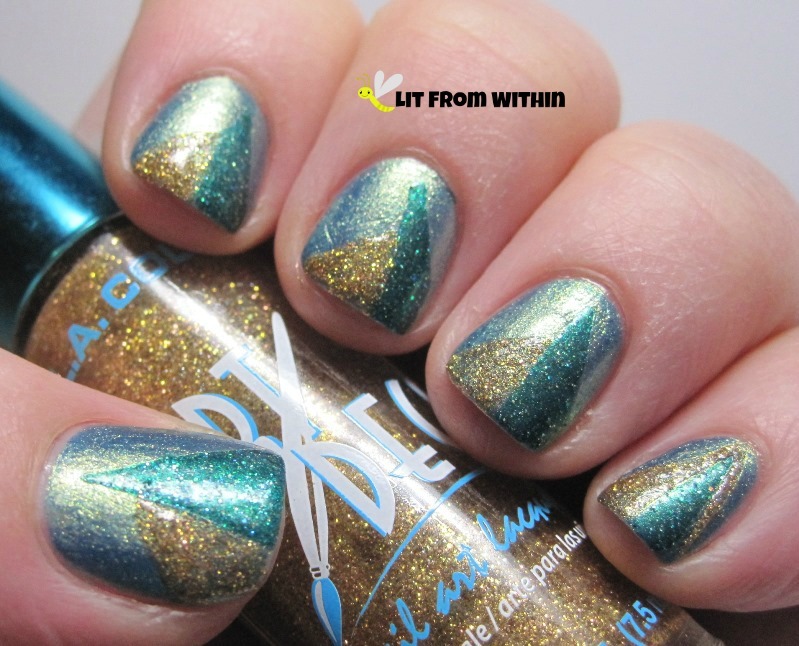 And then, I added more triangles with gold glitter and blue shimmer stripers. Finally, I finished it off with a black stripe. Or, another way, 1/3 of a triangle. 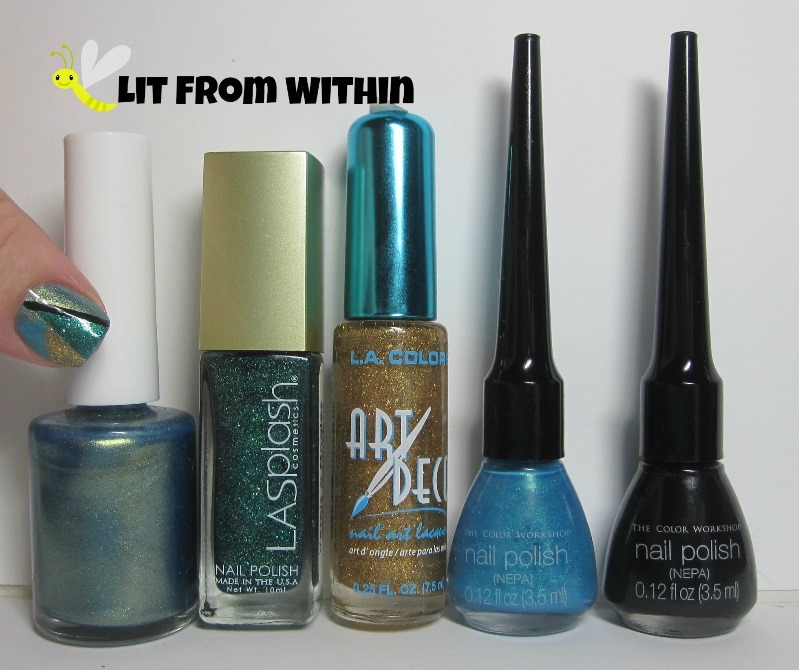 Bottle shot: Carpe Noctem South Haven Sunset, LA Splash Ocean's Fairy, stripers in gold glitter, blush shimmer, and black. What The Cartoon Cat Consumed..
How Can You Ignore A Dragon?